My friend Craig told me about this video last fall. I'm just now seeing that email during my Gmail spring cleaning. It's good! Check it out. To learn more about the band, go here. Pound a Beat for Billboard? Billboard magazine and LG Electronics have teamed up to organize what might turn out to be an interesting opportunity. If you're interested in covering concerts and related events by moblogging with a new enV LG phone, you can enter a contest on Billboard's Web site. Just submit a photo and a 100-word essay explaining why you think you should be one of 30 winners, and you're good to go. The deadline is June 15. If you're selected, you'll get a free LG camera phone and the chance to document music events by posting photos and reviews to a blog featured on the magazine's Web site. Later on, in October 2007, Billboard will choose two runners up and a grand prize winner -- based on the the most popular blog. The grand prize winner will snag an all-expense paid trip for two to a Billboard Music Award show, and runners up get another LG phone. I have no formal relationship with Billboard or LG. This isn't a paid-for post. I just think it's a neat opportunity to win a new phone and participate in a branded grassroots media experiment. Good luck to anyone who enters! I was the guy who painted that mural you enjoyed at the Revival Bar in NYC. I didn't sign it, as back in the day, I never signed my work. I was just doing a web search to see if anyone posted pics of it, and stumbled across your posting on Yelp wondering who did it! Thanks for helping clear up that mystery, Mike! I hope you're signing your work more often these days. It's good. Tuesday, June 5: Fark.com founder Drew Curtis will read from and discuss his new book, It's Not News, It's Fark: How Mass Media Tries To Pass Off Crap As News. This will happen at the Astor Place Barnes & Noble in Manhattan. 7 p.m., free. Rain Bird Corporation is putting out the call for entries to The Intelligent Use of Water Film Competition, which seeks short films (1-20 minutes in actual or excerpted run time) that focus on the topic of water conservation. Narrative, documentary, animated, experimental and/or student-made productions should explore approaches and ideas to intelligently manage and efficiently utilize the Earth's most precious resource. Tonight, Caitlin and I went to a screening of David Teague's new film "Love Suicides." Based on an 18th century play by Chikamatsu Monzaemon, the movie is a silent film shot on black-and-white Super 8. David's been working on it for the last four years, and it shows. While the story itself is well-staged -- and the sets are quite inventive and impressive -- what struck me the most was how the movie feels out of time and place. You almost can't tell that it's modern. You almost can't tell that it's American. The actors do a great job portraying their characters in an impressionistic silent film style, and the title cards go far to enable the illusion. But the highlight might be the score by Richard Marriott. Originally part of the Club Foot Orchestra in the Bay Area, Marriott -- and many of his compatriots -- now live in New York. The score blends Asian themes and traditional songs with contemporary classical music -- and includes musicians such as Ned Rothenberg. Good work, David. I hope great things come of this film. It's an important and impressive piece of work. This playlist contains almost all of the songs and pieces of music mentioned in Haruki Murakami's novel After Dark. In cases in which a composer was named, but not a specific piece, some liberties were taken. Listen to this soundtrack while reading the book! This is one of my favorite videos in recent days. Richard Nash, publisher of Soft Skull, transmitted an email today indicating that Soft Skull has been been acquired by Winton, Shoemaker LLC. This is certainly a paragraph in a key chapter in the history of American publishing, a chapter prefigured by the sale of PGW to AMS in 2003, and one that begins with the sale of Consortium to Perseus in the summer of 2006. I do not believe this chapter is over--for reasons which have to do with a difference between how PGW and Perseus account for returns, the full cash flow impact of the AMS/PGW bankruptcy will not be felt until July. There are any number of regrets--that I was not able to keep the staff is a big one, and there are others that shall remain private--but I beg the subscribers to this list not indulge in apocalyptic thinking about independent publishing. The process of consolidation is, yes, relentless, but it is not eternal. True, it is hard, in some respect, not to feel elegiac. As I've been preparing materials for a process known to those who buy and sell companies as "due diligence," it became clear how many people have contributed to allowing Soft Skull to publish the truly important books it has published over the years--my thanks to you now, my thanks to you eternally. Yet Soft Skull is not over. As our wonderful author Sparrow said when he heard the news: "Soft Skull is dead. Long live Soft Skull." Soft Skull continues as an imprint. Soft Skull is *not* no longer independent. Had I won the lottery and bought Counterpoint from Perseus, instead of Charlie Winton buying Counterpoint and then Soft Skull, we would not have ceased to be independent. Especially given the recent announcement by Perseus that it was closing Carroll & Graf and Thunders Mouth, it seems to me quite culturally valuable for Shoemaker/Counterpoint/Soft Skull--a group clearly embracing the imprint idea, clearly also eclectic and idiosyncratic--to be operating from a more solid financial foundation that hitherto. Allowing Soft Skull at least, to be more reliable and consistent for our authors and for our readers, which are the two communities we serve. Personally, I think this might bode well for the imprint. It's going to be in good company, and if the new group operates in the spirit of its imprints, it could still be fiercely independent. Raise a toast to the old Soft Skull, and ring in the new Soft Skull. (Cheers, Richard.) If you want to take advantage of the discount, get thee to the Web site. Sir Arthur Conan Doyle was born today in 1859. Totally randomly, Caitlin and I watched the 1925 silent movie The Lost World, which was based on Doyle's 1912 novel, just last night. The movie made media history in a couple of ways. One, Willis H. O'Brien, who did the special effects and stop-motion animation, went on to do King Kong, as well. His work inspired later stop-motion animators such as Ray Harryhausen. Secondly, a Lost World game was marketed in conjunction with the film. Basically a sliding puzzle without the containing frame, the game consisted of tiles players could move one space laterally in order to rearrange into the finished image. I'm curious whether that's one of the first example of movie tie-in merchandising. I'm a big fan of Seth Godin. I've known him since the earlier days of Fast Company magazine; I've read his books, columns, and blog; and I worked with him for the first year of Squidoo. He's a wonderful example of the self-made man in the knowledge economy. And he's a bright bulb. So when I learned that his new book The Dip, was coming out, I knew I had to check it out. It's the first book he published since I left Squidoo, and the initial coverage -- particularly in Ad Age -- left a little to be desired. When I was in Boston last Friday for a business meeting, I picked up a copy at a local bookstore. And I'm glad I did. Seth is a little like Bill Gross of Idealab in that he occasionally practices the art of spaghetti idea generation: You throw noodles against the wall and see what sticks. And while, at about 80 pages, The Dip is a one-trick, if not -idea, pony, Seth does what he's trying to do very well. Here's my take. I could be totally wrong. 1. The Dip could be Seth's Who Moved My Cheese?. It's that short a book. It's that tight a package. And the book is designed to be shared. Every copy of the book includes a blow-in card entitled "Stick or Quit?" that encourages people to buy books in bulk for their team and company. You can do so at Get the Dip. The book also features a page in which you can write a list of people who need to get the book next. Consider it your routing list for group reading. 2. Multiple media matter. In the store display, accompanying the stacks of slim books were stacks of CD's. Each CD cost $5 and was an abridged audiobook of the book itself. Wait a minute: an abridged audiobook of an 80-page book? For $5? Brilliant. Add to that the book's mentions of Seth's Web site, blog, and company Squidoo, and you get multiple touchpoints in one tidy package. Sweet. 3. Seth involves and thanks his friends. One of the hallmarks of a good team member is that they recognize the people who help them succeed. Seth does this in spades. The illustrations in The Dip are all provided by Hugh Macleod, who's worth following in his own right. Cross promoting talent -- and projects -- can go far, and the book does that. In the text, Seth gives props to his copy editor, and in the Best in the World? end notes, he name drops the Squidoo team, as well as his editorial team at Portfolio. By doing so, Seth shares some love, sheds some light, and helps ensure that the people who help him help people might continue doing so. 4. Seth gives you tools you can use. You need to read the entire book -- not difficult -- to find them all, but if you're not already aware of Zipf's law, The Magic of Thinking Big (a book that changed the way Seth thought about success -- and a book I've already ordered), Zelma Watson George and Jacqueline Novogratz, you will be soon. All are worth some attention. "Every time you switch lines, you're starting over." "Don't fall in love with a tactic and defend it forever." "The time to look for a new job is when you don't need one." "Quitting when you're panicked is dangerous and expensive." This last point -- the beauty or ugliness of the simple idea -- is what some reviewers have latched onto, and that fact indicates that they've missed the point. Seth wraps his lessons up in other lessons you can learn from. Pay attention to the entire package. Am I glad I read the book? I think so. Am I glad I gave thought to the book? Damn straight. When you throw noodles against the wall, maybe it's less important that you threw noodles -- and more important that you made noodles. Monday, May 21: Beauty Bar New York's event The Phantastic Invisible Tentacle will celebrate Herge's legacy featuring slideshow readings of original Tintin-inspired material. Contributors include Josh Neufeld, Nick Bertozzi, Jason Little, and R. Sikoryak. The reading will be followed by a short presentation about Herge and Tintin, a documentary, Francophone pop, and DJs Stephin Merritt, Jesse Fuchs, Go-Karff, and ERL. The freee vent kicks off at 8 p.m.
Tuesday, May 22: The 100th birthday of Georges Prosper Remi (1907-1983), better known as Herge. That's the Belgian creator of The Adventures of Tintin. Rick, C., and I went to Coney Island this weekend. One of the things C. was looking forward to was the Hairstyle Illusions photobooth crouched underneath the Wonder Wheel. 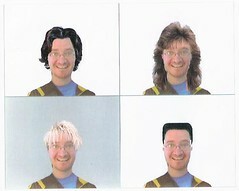 Each of us took a picture, and these are my coiffure fantasies. I kind of like the top right. What think you? The city of Franklin, Indiana, will host the inaugural B Movie Celebration from August 17-19. Over the course of the event, more than 50 classic B movies will be screened. Special guests will include special effects guru Tom Savini, B director Jim Wynorski, and Ed Wood collaborator Conrad Brooks. Lloyd Kaufman, the "mayor of Tromaville," will be awarded a Lifetime Achievement Award and will present a Troma retrospective. I recently served as a judge for the Association of Alternative Newsweeklies's AltWeekly Awards. Not too many days ago, the organization announced the award finalists. I contributed to selecting the Website Content Feature category, which debuted this year. The winners will be announced in June. Congratulations to everyone involved! Science-fiction hacktivist Cory Doctorow was kind enough to include some Anchormen samples in an episode of the Cory Doctorow Podcast. In said episode, Cory features snippets of two Anks' songs, "Moon Face" and "Mass. Ave. Attack," both of which hail from the fine CD Punk Rock Is Awesome. Cory also reads from his way-forthcoming young adult novel Little Brother. You can preorder the book from Amazon.ca, but not stateside yet, as far as I can tell. It's due out from Tor in May 2008. Like, a year! Thanks for involving the Anks, Cory. And thanks for the name drop. I've reworked the Media Diet post Covering All the Baseball as an essay to be included in a forthcoming issue of Zisk, the "baseball magazine for people who hate baseball magazines." You can order your copy online through a number of quality retail establishments. The podcast of the panel I organized and moderated at SXSW Interactive earlier this year is now available online. When you have half a mo, give it a listen and let me know what you think!